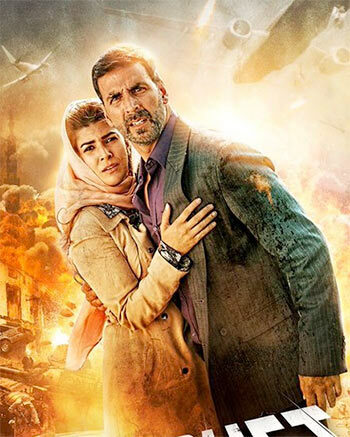 REVIEW: AIRLIFT IS TAUT, TENSE, TERRIFIC! 'Oh what a beauty Akshay's performance is. Old-school gallantry, contemporary tone, his measured delivery is the soul of and saviour in Airlift,' says Sukanya Verma. It's seldom a question that worries me any time I witness the Hindi film hero in action. Nothing I don't know -- this archetype has an endless stock of dishoom dishooms, divine interventions or dramatic means to fall on. Akshay Kumar's Ranjit Katyal, a Kuwait-based businessman of Indian origin, certainly plays a hero except he doesn't spurt out of some Bollywood potboiler. Instead, he is modelled after real-life champions characterised by extraordinary guts and tremendous power of persuasion. Back in 1990, during Iraq's invasion of Kuwait, over 1,70,000 stranded Indian citizens were safely evacuated from Kuwait to India, one of the largest in history. From a record-breaking figure on paper to its flesh and blood adaptation on celluloid, Airlift is a honest endeavour to recount a horrifying chapter of history whilst paying tribute to its unsung heroes personified in Katyal's bravura and Sanjeev Kohli (a first-rate Kumud Mishra), an Indian government official working to expedite the said evacuation. Katyal doesn't start out as a saviour. Pragmatic to the core, any mention of India invariably turns on his snarky side. Still, he's protective about his family. No sooner he learns about Saddam Hussein's invasion, he suggests that his wife (Nimrat Kaur) and daughter should immediately flee to London. This ability to be on the ball and take charge makes him an easy pick to play mass protector, a role he accepts and fulfils slowly but surely. Do not picture a swashbuckling Akshay flapping his imaginary super cape and fixing things in a jiffy against blasting rock music. Instead, the plan of action in Airlift is devoid of strategy, schemes or smart. In the face of absolute chaos, destruction and intimidation, desperation is spontaneous, solidarity makes sense and negotiation is the sole weapon of the civil folk. While Menon ticks all these boxes rather deftly, he doesn't dwell too much on the international politics or the feeble workings of diplomacy barring an occasional pot shot or two at the shoddy state of bureaucracy. There's an interesting read-between-the-lines moment lamenting unstable governments as opposed to permanency of babus picturised on Surendra Pal and Mishra. Another one's where Akshay Kumar plays bluff with a quirkily menacing Iraqi army chief (Inaam-ul Haq, borderline caricature, bizarrely effective) during dinner is laced with sly tension. Oh what a beauty Akshay's performance is. Old-school gallantry, contemporary tone, his measured delivery is the soul of and saviour in Airlift. Larger-than-life might is commonplace, but larger-than-life intensity is rare. Here, it is unmistakable, unceasing. It's his grasp of Katyal more than the script itself voicing the bitter urgency of Airlift's on-going crisis. The charismatic actor features in practically every single frame of Airlift -- Priya Seth's terrific camerawork dedicatedly captures his distress, doggedness, disillusionment and relief in detail as well the numerous (well-acted) pairs of eyes pinned on him for rescue. It vexes his self-seeking wife no end. What's this 'Yeh Indian Indian khelna,' she demands to know. Nimrat Kaur perfectly grabs the tone of an ordinary person, someone who doesn't want to concern herself with another's problem and cannot understand her do-gooder husband's need to otherwise. Even so, she does seem a little too well turned-out for the occasion. The songs are a hindrance to the pulsating narrative. The writing could be sharper, piercing. The patriotic fervour towards the end is all over the place. But then there it is -- the Indian flag -- glorious and soaring and a moist-eyed Akshay Kumar looking at it like a man who has done it proud. What will he do? Nah, he did it!